Articles include -- A Blacksmith's Rebuttal by Eric Reid - Chris Breiseth Moves In by Will Masters - Ed Cronk Packs Out by David Schuman - A Puzzling Picture (alumni giving) by Fred Laise - Rinchin', Readin', and Rithmatic by David Weiss - vanden Heuvel at UN by anon. - Lindsey GRant pictures available by anon. - A Wild Affair by Ned Serling - The Gallopavo Wars (Turkey Bowl) by Jacque Lezra - Birth of Ben Schuman by anon. - Guru Gordon [Gilbert] by Jay Pulliam - News of the Paskows by anon. - Coed report available by anaon. 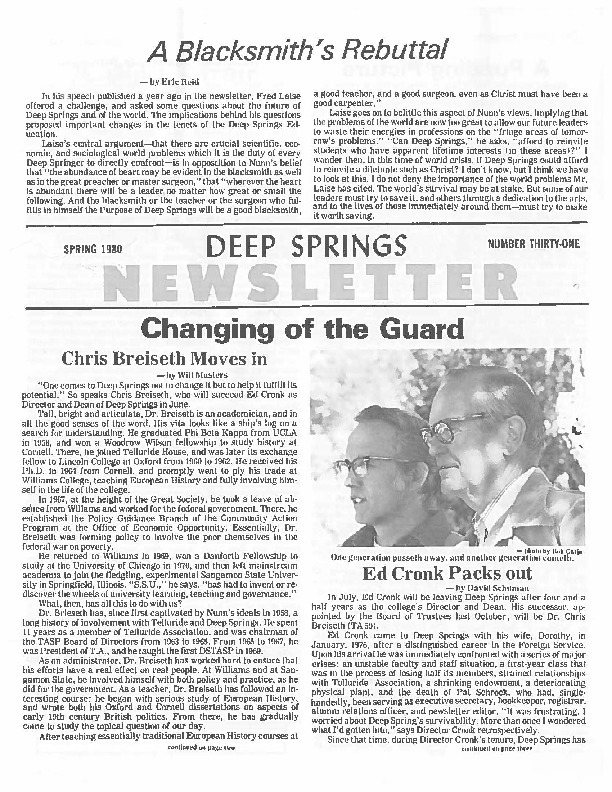 Deep Springs College, “DS Alumni Newsletter Spring 1980,” Deep Springs Archive, accessed April 21, 2019, http://archive.deepsprings.edu/items/show/1566.